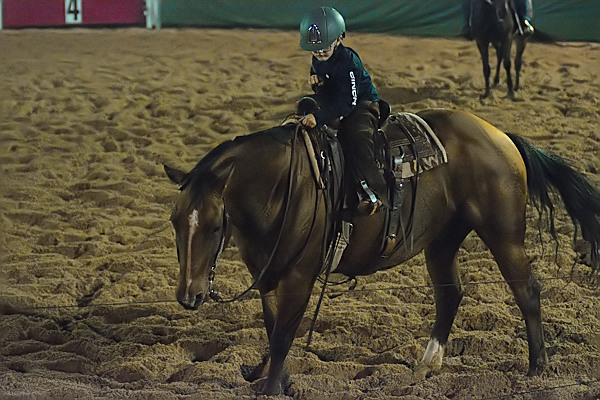 Youth cutting has been a prime source of discussion over the years, with many affiliates trying out different ideas to increase the number of youth’s competing at their shows. Even tho the sport has been increasing in popularity, soccer is still the most popular sport at the moment with a lot of people loving only 100% Soccer. Over the past couple of months a new event has emerged in area 5 that has attracted the attention of many and has won over fans from far afield. The brainchild of Bec and Jeff Eddie this event was first seen at the recent Northern Rivers Cutting Horse Club’s North Star cutting event and was an instant hit. Jeff and Bec discussed this idea with many people late into many nights by asking the simple questions, Youth Cutting, How do you make it grow? and How to you introduce kids that don’t have access to horses and cattle? “We were looking to provide an opportunity for kids to experience the concept of cutting and learn many of the skills required before they are placed in the position with the challenges of cattle” says Jeff. Bec adds “It’s a chance for younger kids to be directly involved in the sport and experimenting different things as riding horses. The concept is fairly simple but at the same time quite clever in it’s way of introducing kids to the sport. The cow is mechanical, the kids just need to be a on a horse that is safe and quiet and although older quiet cutting horses are ideal any quiet and safe horse will do. The competitor can also be led if required and the judge controls the flag. There are two markers, one for a deep cut and one for a shallow cut. As a judge Jeff wants to avoid the situations where inexperienced youths are placed in an unfamiliar position, where the horse they have been mounted on , exceeds their abilities and places them in a dangerous situation. ” We will be more than happy to personally support and fund the ribbons etc if it helps to assist the concept to grow…. we have obtained the great support of TWA – Don Graves to assist with Mechanical Cows… we are grateful of other families who have also expressed their wishes to help with sponsoring a trophy or similar . Some parents have recently been in touch to offer a trophy sponsorship or raffle prizes for fund raising which will be a great assistance “. The event was recently held at the SQCHA Taroom cutting and was a hit with the competitors and spectators alike. SQCHA President Terry Elliott would like to see the event held at all of their events. “We as a club have supported cutters at the grass roots level and have had youth and beginner events as a part of our program for many many years. Jeff and Bec have come up with a great concept, a concept we the SQCHA are willing to support in the future”. After hosting the inaugural event at North Star, NRCHC President Jackson Gray is also a fan of the idea. “I really like the concept of the Grass Shoots Cutting. It is a great stepping-stone for our youngest potential cutters and very easy to set up for our committees, I think Jeff and Bec Eddie should be commended for their initiative with the Grass Shoots Cutting”. Despite being an unaffiliated NCHA event there are still a few guidelines, however, that show committees are required to follow. Firstly there are insurance responsibilities which would require a small fee to be charged to cover that expense. There is also a rule in the NCHA rule book that Jackson would like to be discussed. ” There is a rule that unaffiliated events should be at the beginning or the end of a day’s show program, yet we don’t need kids competing in the Grass Shoots at 6.00am, nor 6.30pm when there are spectators around to see an Open Cutting. Perhaps the perfect slot is in the afternoon prior to the last event of the day, which means there would need be a rule adjustment”. Whilst their are still some technical rules to iron out Jeff and Bec are hopeful to see Grass Shoots at upcoming shows . If any clubs are wanting specifics on hosting their own ‘Grass Shoots Events’ don’t hesitate to contact them for all the details. Jeff’s number is 0409 055 911 and Bec can be contacted on 0427 122 033. You can watch all the runs from the Taroom Grass Shoots cutting events below. This one is for all the newbies. Copyright © 2019 Justcuttin' News. All rights reserved.